Below is a post by Renee Woliver about SIT Professor Jeff Unsicker, who recently conducted assessment of BRAC’s Advocacy Unit in Bangladesh. SIT Professor Jeff Unsicker recently returned from Bangladesh where he completed a Rapid External Assessment of the Advocacy Unit of BRAC – one of the world’s largest and most respected development NGOs. He also facilitated a four-day training on advocacy for 20 staff in the unit and several other BRAC programs. Jeff teaches policy analysis and advocacy courses at SIT. Read his complete bio. Below is a post by Renee Woliver about SIT Professor Jeff Unsicker, who recently conducted assessment of BRAC’s Advocacy Unit in Bangladesh. SIT Professor Jeff Unsicker recently returned from Bangladesh where he completed a Rapid External Assessment of the Advocacy Unit of BRAC – one of the world’s largest and most respected development NGOs. He also facilitated a four-day training on advocacy for 20 staff in the unit and several other BRAC programs. Jeff teaches policy analysis and advocacy courses at SIT. Read his complete bio. The director of BRAC’s Advocacy Unit, Sheepa Hafiza, is an SIT alumna. She holds a postgraduate diploma from SIT’s program in NGO Leadership and Management and a master’s degree from the Program in Intercultural, Service, and Leadership. Sheepa requested the assessment and training and also provided invaluable support during each. The training included a multi-day field visit to a rural district of Bangladesh to observe how BRAC is organizing ultra poor villagers (those without the resources to participate in microfinance programs) and allies among the local elites to advocate for their rights to basic government services such as social safety net funds, land, health services, and education. A second “visit” was within Dhaka where Jeff joined a public demonstration and workshop with other NGOs and government officials to advocate for ratification of the UN Convention on the Rights of Migrant Workers and their Families. Jeff also had interviews and meetings with several dozen staff and external resource persons, including BRAC’s renowned founder and chairperson, and reviewed numerous English language documents. Jeff was impressed by what he learned. 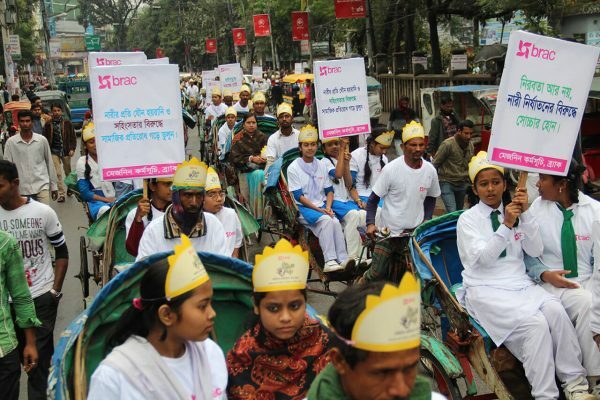 “As is the case with so many aspects of BRAC, the scale of the advocacy work is incredible. Here’s an example. One of the most important sources of revenue in Bangladesh is the remittances that migrant workers, mostly unskilled, send home from the Middle East and other regions. Yet these workers have little protection, including from often corrupt dalals or middle men who the migrants rely on for securing jobs, passports and visas, and travel. Additionally, from the perspective of changing public policy, Jeff asserts that these efforts have been very effective. Jeff’s report concluded that BRAC, while not widely known for policy advocacy, has a very long history of shaping the national policy discourse and ensuring that poverty and related issues are at the forefront of the policy agenda setting.